One of the major sections of our daily life in which the growth of technology made change was Reading. Today, we would have to say that reading has two versions called printed reading and eReading when a kid asks us. Such a noticeable change had induced in these years attracting a larger number of users to buy eBook readers and eBooks as well. Device manufacturers analysed this trend much earlier and they were brave to introduce eBook readers like Kindle along with Kindle Store in the case of Amazon. We should say that Kindle is the most popular eBook reader available in the market with the support of a large number of novels, books, stories etc in their digital form. 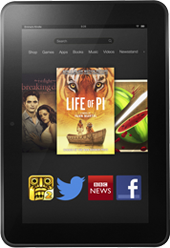 This device is now having multiple variants like Kindle, Kindle Fire and Kindle Fire HD etc. The fact is Kindle is available only for eReading purposes whereas you can play games, watch videos and movies, etc in the former devices. This also means that Kindle Fire and Kindle Fire HD are major competitors to Apple iPad because of its low price range and integration with Amazon Inc. Though both devices have connectivity options, we will have to say that Kindle Fire is useful to you when you want to do some media based activities in your device. Now, let us have a look on the top features of Kindle and Kindle Fire, which made it the best eReader available in the market. When it comes to eReading, everything packed under single window so that you do not need to run out for buying books or other stuff. The same thing is applicable for Kindle and Kindle Fire because both of these devices have very tight integration with Amazon’s collection, which is a leading provider of both digital and printed books around the globe. This means that you will not have to run behind some other stores or websites for getting your favourite books in their digital form. Once you have purchased the book, you can store it in your kindle account and read it according to your comfortability. When it comes to Kindle Fire, the device has support for videos, movies, music etc through Amazon’s store, which is enough to be a rival for Apple iPad’s iTunes integration. Obviously, this large amount of collection is grabbing users to the product and service. When compared to other eReaders and tablet PCs available in the market, the price of Kindle and Kindle Fire are said to be much cheap because you can purchase Kindle Fire for $199, which is much low when compared to Apple iPad’s $500+ price range. If you just want to listen to some music and movies, read your books in a comfortable manner through your device, Kindle Fire or Kindle is your best choice when there is confusion with Apple iPad. Of course, this less price range is a noticeable feature of Amazon Kindle and Kindle Fire, attracting mid-budget customers to the service. Technical specifications and features of Kindle and Kindle Fire are also worth checking out because both of them are enough to provide you seamless reading experience and entertainment for hours. When it comes to Kindle, you will be gifted with around 8 weeks of battery life (when Wireless is off) as the device is just used for reading your favourite books. When it comes to Kindle Fire, the battery life is reduced to hours but still it keeps the decency in offering. Both of devices are providing a good display, which gives less strain to your eyes while reading.